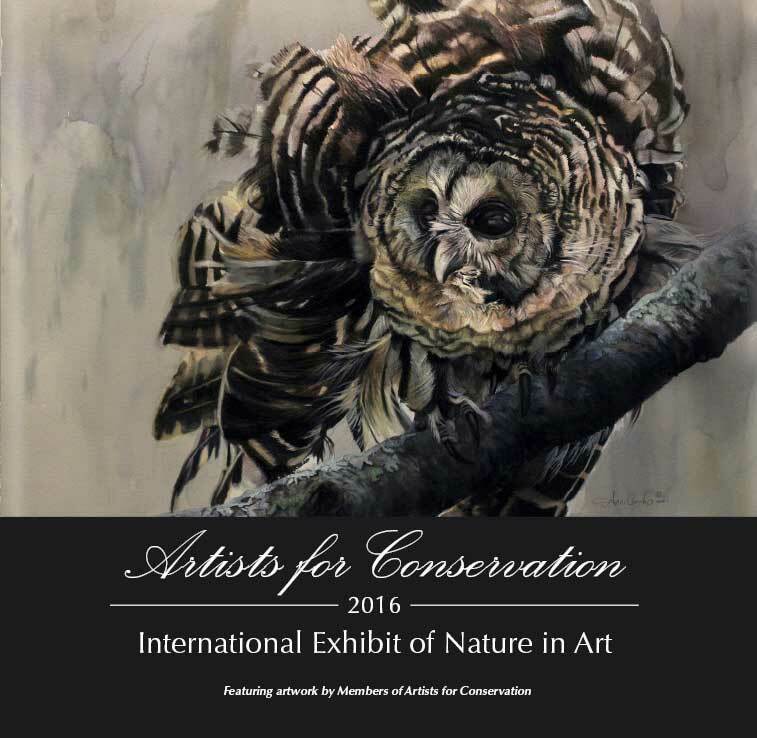 Vancouver, BC CANADA - June 30, 2016 - Artists for Conservation is pleased to announce that acclaimed US artist Anni Crouter's painting "Spooked", depicting a Barred Owl, has been selected for the cover of the 2016 Artists for Conservation exhibit book. The annual hardcover "coffee-table" book is published on sustainably forested paper, as a companion to the 9th annual AFC Exhibit, showing in Vancouver and North Vancouver, BC running September 29 thorough to October 3rd. The image will be on display in AFC's virtual online exhibit this fall. The 2016 Exhibit book is published as a companion to the annual exhibit. The 228-page tribute to AFC's global pool of artist talent and features artwork juried into the world's top conservation-themed exhibit and sale - centrepiece of the upcoming Artists for Conservation Festival, as well artworks featured in a broader online virtual show.The 2016 Artists for Conservation Festival represents AFC's 9th annual exhibition of Members' artworks and fifth annual exhibit opening at the Artists for Conservation Festival. All proceeds from book sales support Artists for Conservation charitable programming. The book can be pre-ordered online or purchased at the Artists for Conservation Festival. Supplies are very limited and this prized collector's book is sure to sell quickly.